Creamy cauliflower soup with walnuts in a blue bowl on a light slate,stone or concrete background.Top view. The weather has been distinctly cold and the frosty nip has made me want to stay in and be a comfort eating recluse and although my life doesn’t allow for the luxury of staying indoors I can at least enjoy some rich and deliciously warming food. Whenever the cold weather sets in I always like to make hearty soups and I can’t help thinking that we may eat less soup nowadays than we did a few decades ago. 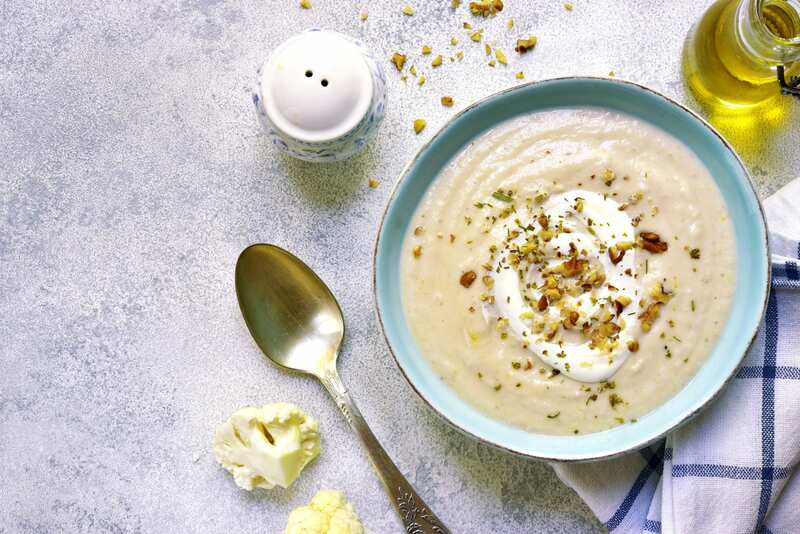 I really like to make hearty soups that use up left over ingredients and vegetables, but I also enjoy making this lovely cauliflower and walnut soup which is really creamy, but contains no dairy cream. Place the cauliflower , onion and stock into a large saucepan and bring to the boil. Cover and lower the heat to a simmer for 15 minutes. Pour the mixture into a food processor and pulse until a smooth puree is achieved, add the walnuts and milk and pulse until smooth. Pour the soup mixture into a clean pan and season, then bring to the boil and serve in heated bowls. Garnish with chopped walnuts and a sprinkle of smoked paprika. « Merc CLA pitches for A3 rivalry and just might pull it off!